A plaque has been unveiled in central London to mark the 90th anniversary of the Royal Air Force (RAF). The green plaque sits at 80 Strand, once the Cecil Hotel where the RAF had its first headquarters in 1918. RAF spokesman David Forsyth said: "Amazing progress has been made in just 90 years since we were born." On 1 April Red Arrows will fly in formation with four Typhoon aircraft along the Thames to the London Eye, to celebrate the anniversary. The RAF was formed by merging the Royal Flying Corps and the Royal Naval Air Service during the end of World War One. Its first headquarters were at the Cecil Hotel, which was requisitioned for the war effort in 1917. 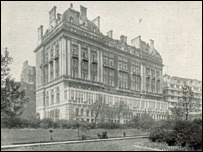 The air force remained there until 1919 and most of the original building was demolished in the 1930s. Mr Forsyth said: "Those early service men and women would be astounded by today's modern technology - jets, rockets, GPS-guided missiles and unmanned aircraft. "But it all began with string, wood, canvas, a primitive engine and an idea that air power was not just for dreamers." Air Chief Marshal Sir Glenn Torpy unveiled the plaque on Sunday, in a ceremony followed by the RAF's annual memorial service at nearby St Clement Danes Church.